Safari Magic. 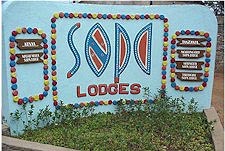 Sopa Lodges & Hotels in Kenya, East Africa. 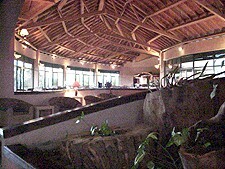 There are 4 Sopa Hotels, 1 in Kenya and 3 in Tanzania. They are notable for their grand, visually stunning public areas, excellent dining and large, nicely appointed guest rooms. Looking out over the seemingly endless Serengeti plains, this hillside lodge is a tranquil oasis set in over 14,000 sq kms (5,000 sq miles) of National Park. The Serengeti plains are host to a dramatic annual migration of hundreds of thousands of wildebeest and numerous other species of animals indigenous to the area. 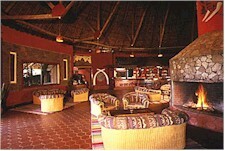 Opened in 1992, the lodge can accommodate 170 guests in 79 suites, each enjoying wall-to-wall carpeting, a private lounge with a mini bar, a bedroom with two queen size beds and ample room for a third, an en-suite bathroom with shaver sockets and a hair dryer, and a private verandah which offers stunning views over the plains. The lodge has direct-dial satellite telephone facilities as well as satellite television and wildlife-video-film options. 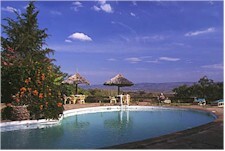 The double size pool offers a refreshing interlude between game drives as well as wonderful views over the rolling plains of the Serengeti. 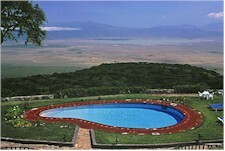 The Ngorongoro Sopa Lodge is, and will remain as, the only tourist development on the eastern rim of the crater and thus offers unique and spectacular views down into the crater floor and of the sunsets over the western horizon. Another major advantage of this site that our guests can enjoy is the fact that their crater safari begins within five minutes of leaving the lodge. 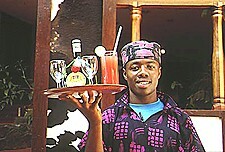 Opened in 1992, the lodge can accommodate 190 guests in 92 suites, each enjoying wall-to-wall carpeting, central heating, a private lounge with a mini bar, a bedroom with two queen size beds and ample room for a third, an en-suite bathroom with hair dryer, and a private solarium which offers stunning views either down into the crater floor below or of the setting sun over the western horizon. The lodge has direct-dial satellite telephone facilities as well as satellite television and wildlife-video-film options. A swimming pool is situated on the very edge of the crater and the water is invigorating at any time of year and a perfect area to unwind and relax while enjoying the views of the crater floor below or of the sunsets in the evenings. The lodge is located on the eastern side of the Tarangire River 120kms (75 miles) from Arusha by road and is one of Tanzania's most easily accessible conservation areas. 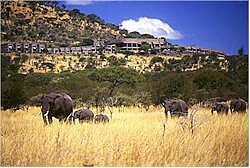 The lodge is 30kms (20 miles) from the park entrance gate, about an hour's drive through an area rich in wildlife. The alternative is a 20 minute chartered flight from Arusha followed by a 45 minute drive through plentiful wildlife to the lodge. 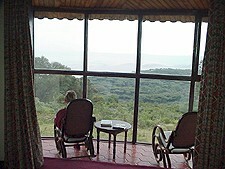 Opened in 1995, the lodge can accommodate 160 guests in 75 suites, each enjoying wall-to-wall carpeting, a private lounge with a mini bar, a bedroom with two queen size beds and ample room for a third, an en-suite bathroom with shaver sockets and a hair dryer, and a private verandah which offers stunning views over the baobab studded landscape. The lodge has direct-dial satellite telephone facilities as well as satellite television and wildlife-video-film options. 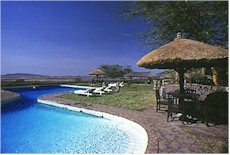 The unique swimming pool which is located at the edge of a rocky gorge has its own bar and snack kitchen and offers a refreshing interlude between game drives. 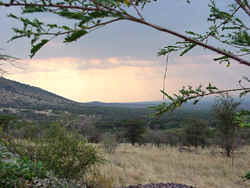 The lodge has direct-dial telephone facilities as well as satellite television and video options. 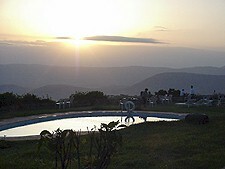 The lodge has a freeform, fresh-water pool which offers spectacular views over the valley.